You know the value of fire alarm systems in protecting lives and property when you a fire occurs, an organization may struggle or fail after a catastrophic fire. That’s why the effectiveness of a fire alarm system depends on the partner you choose for installing, monitoring, and servicing it. QEC, Inc. can provide your total solution to Fire Alarm System design, budgeting, installation, maintenance, testing, and UL Listed Monitoring. 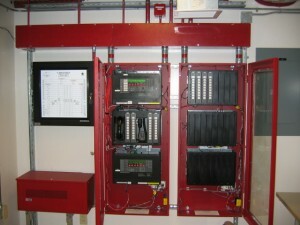 We have been providing Fire Alarm solutions since we started in 1986. We have replaced existing systems on 5 major Hospitals, a College campus, Bechtel-Nevada North Las Vegas Nuclear Research Facility, the Grand Junction Regional Center, and many more industrial and commercial buildings. We currently have 2 NICET Level IV and 1 LEVEL II certified Fire Alarm Technicians on staff. We have 4 current employees with Simplex-Grinnell 4100 network and 4100U factory training. Our employees all have Fire Alarm training during their 4 year apprenticeship program, Journeyman upgrade classes, and in house training on a continuing basis. Our office staff, project managers, jobsite foreman, and electricians / apprentices all have extensive backgrounds in fire alarm systems including addressable devices, large campus installations, highrise, healthcare, voice evacuation, paging interface, HVAC interface, jet fuel interface, medgas system wiring, nurse call interface, etc. Every project we have been a part of has been completed within budget, on time, and a customer who is 100% satisfied with the results. Site survey- to determine existing conditions, determine what Codes are applicable, does it have an existing system, private versus public mode. Budgeting according to your ability to finance, and working with the local AHJ. Design and engineering services, including a PE, or FPE stamp if required. The highest quality installation meeting everyone’s expectations and more. Ensure on retrofits that existing system protection remain in service until the new system is operational. Demolition of abandoned raceways, devices, patch and paint if requested. Closeout paperwork including operation & maintenance manuals, NFPA testing paperwork, and meticulous as-built drawings. Inspection involves regular visual examination, activation, and documentation of all devices in your system, including panels, detectors, pull stations, horns, strobes, annunciators, and door holders. Testing determines the functional status of a system. Annual procedures determine that the system operates as designed and include a test of monitoring connections. Sensitivity testing of every smoke detector in you system is required every two years. Maintenance is work performed to keep equipment operable, including repairs. Maintenance of you fire alarm system involves regular replacement of the 24-hour backup batteries. Recordkeeping includes logging and retention of relevant records. UL Listed Central Station Monitoring our prices are competitive and we use a UL Listed Monitoring Service. St. Mary’s Hospital, Grand Junction Regional Center Campus, V.A. Medical Center, CNCC Rangely College Campus, Solvay Chemical, Bechtel-Nevada DOE Las Vegas Facility, just to name a few. References furnished upon request. Our professionals are NICET certified, factory trained, and ready to support your organization’s fire protection systems and service requests. Contact us for more information.